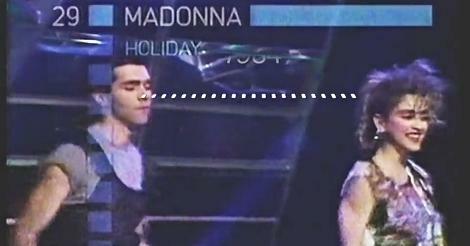 This video clip features a young Madonna making her first ever appearance on Top Of The Pops. Holiday was the first UK hit single for Madonna and broke into the Top Ten during January 1984, peaking at No.6. The single was re-released in 1985, re-entering the UK singles chart at No.32 on July 28th and reaching No.2 on 11th August, being held off the top spot by her own "Into The Groove" single. You may remember that Frankie Goes To Hollywood also claimed both the No.1 and No.2 spots in 1984 with "Two Tribes" and "Relax". 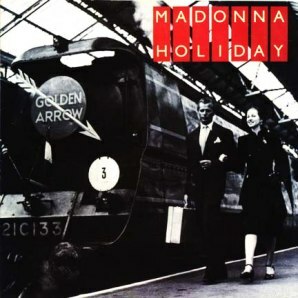 "Holiday" was re-released for a third time during 1991 as part of "The Holiday Collection" EP, reaching No.5 in the UK. The track was produced by John "Jellybean" Benitez who also had several of his own hit singles during the 80s including Sidewalk Talk (#20 in 1985), The Real Thing (#13 in 1987), Who Found Who (#10 in 1988) and Just A Mirage (#13 in 1988). I actually purchased his album Jellybean Rocks The House on cassette, and it was a very decent listen. Jellybean also produced several other Madonna tracks including "Borderline", "Crazy For You" and "Gambler", as well as creating 12" remixes of many of her 80's singles. "Holiday" is an infectious tune that has everything an 80s tune should have - electronic handclaps, synth strings and plenty of cowbell. The song received plenty of praise from the critics and was the first UK top ten hit for Madonna. Holiday eventually sold around 795,000 copies and also reached #16 in the U.S.,#4 in Australia and #9 in Germany. Madonna has now sold over 300 million records worldwide and is recognised as the world's top-selling female recording artist of all time by Guinness World Records.